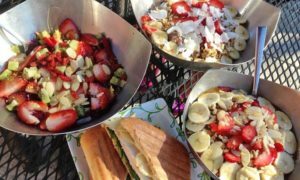 Vitality Bowls is a superfoods cafe! The innovator of superfood bowls, Vitality Bowls offers only the highest quality and the most potent antioxidant vitamin rich food. Not only is their food healthy, it is also delicious! While one might think that a superfood cafe would have a limited selection, Vitality Bowls has all kinds of food options and a diverse menu. Vitality Bowls is more than just a juicer! In fact, juice only makes up 5% of their revenues. As many ingredients as possible are organic and all superfood products come from Honduras, Brazil, and other countries in Latin America. And of course, everything on the menu is good and good for you! HOW DID VITALITY BOWLS START? Vitality Bowls was founded by parents who wanted healthy and delicious food options for their daughter, who has a lot of food allergies. Now, lots of parents can provide healthy and delicious food options for their children! Many Vitality Bowls franchises are near schools and many students enjoy coming in. Since those parents started Vitality Bowls the company has soared! Sales have doubled in the past four years. More than 30 cafes are open now across the United States. And now you have the chance to be a part of the growing Vitality Bowls family. 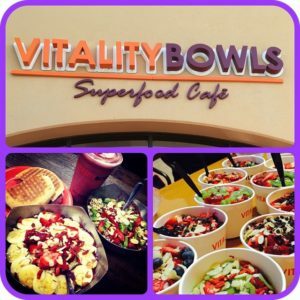 Vitality Bowls is looking for passionate franchisees to join the superfoods club. An ideal candidate is an entrepreneur who is not afraid of hard work. For the first couple months, owners are pretty involved. Once things are up and running, franchisees adopt a more absentee ownership model, especially those who decide to hire senior operations managers. Of course, the ideal candidate for a Vitality Bowls franchisee is someone who lives a healthy lifestyle and is interested in fitness and healthy food. Vitality Bowls engages in the community. An ideal candidate is comfortable meeting people, has managed a team before, and is comfortable acting as more of a mentor than a boss. A background in restaurants is not required! Vitality Bowls will train you well. Vitality Bowls is a part of their community and when you’re a franchisee with Vitality Bowls you’re a part of a family. You’re also a leader. Employees at Vitality Bowls are highly valued and franchisees and managers are in place to lead and guide them, not just as employees, but as human beings. As a franchisee with Vitality Bowls, you’re also the boss! While Vitality Bowls provides everything you need, from training to suppliers to resources to advertising tips, they also give you room to express your creativity as an entrepreneur when it comes to store design. Vitality Bowls is a place for families, young people, children… it’s a place for anyone and everyone who is looking for healthy food options, anyone who suffers food allergies, and everyone who likes food that tastes good and is good for them! With dine in and take out options (ordering from an app! ), Vitality Bowls meets the needs of many modern diners. Vitality Bowls offers a fun, fresh opportunity for both franchisees and community members everywhere! – Reposted from the Franchise Brokers Association for the benefit of our visitors.